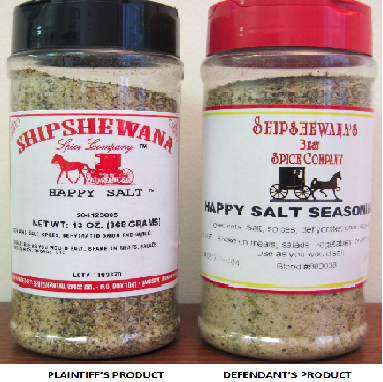 Shipshewana, Indiana – Indiana trademark lawyers for Plaintiff Kevin Horn, sole proprietor of Shipshewana Spice Company of Warsaw, Indiana, filed an intellectual property lawsuit in the Northern District of Indiana alleging that Bob Wilson d/b/a Amish Farms and Shipshewana’s Best Spice Co. of Millersburg, Indiana infringed the trademark “HAPPY SALT,” Trademark Registration No. 4,241,663, which was granted by the United States Patent and Trademark Office. Horn also alleges trademark counterfeiting, false description, trademark dilution and unfair competition. Plaintiff Horn of Shipshewana Spice states in his intellectual property complaint that his company has been selling spices and other seasonings since 1994 both locally in north-central Indiana and online at www.shipshewanaspicecompany.com. Plaintiff further claims that the trade name “HAPPY SALT” has been associated with his spices since 1994. A trademark registration for this mark in International Class 30 for “Seasonings, namely, Seasonings in salt” was granted by the USPTO on November 13, 2012. Defendant Wilson, alleged to be the operator of the website www.amishfarms.com, is accused of offering counterfeit goods offered as “HAPPY SALT SEASONING,” “HAPPY HEARTS SALT FREE SEASONING” and “HAPPY SEA SALT SEASONING.” Plaintiff also protests the use by Defendant of the business name “Shipshewana’s Best Spice Company,” which it contends is nearly identical to Plaintiff’s business name, “Shipshewana Spice Company”. Horn seeks equitable relief along with damages, costs and attorneys’ fees. The case was assigned to Judge Joseph S. Van Bokkelen and Magistrate Judge Christopher A. Nuechterlein, in the Northern District of Indiana and assigned Case No. 3:15-cv-00524-JVB-CAN.